“Yikes… it’s chilly today.” “Blergh, it’s so crowded on campus.” “Ack! it’s 8pm and it’s already dark!” These are just a small sampling of the continuous little realizations that have been popping into my head during this, the first week of September. And let us not forget “YIKES, Where the hell did August go? !” That one thought in particular has been pestering me most of all. It’s a good question though. Reflecting on it reminds me to appreciate that my august was truly packed to the brim with great experiences: I tag-team hosted my first garden party with my mother, where I spent much of the night in the kitchen ensuring a constant flow of pizzas and cocktails for our 15 hungry guests; I harvested vegetables and enjoyed many lunches at the farm; I visited with friends, and said goodbye to one embarking on a big adventure; I rode my bike to work every week, conquering my fear of the 8th avenue hill in the process; I ate and drank new and inspiring foodstuffs. And that’s just to name a few. With all that excitement, I found myself making the same few recipes again and again and again. Not that this is a bad thing, it’s just what I do when I’m busy or I’ve recently fallen in love with something new. First there was pizza, and then a heck of a lot of potato salad, and then finally these cookies. The precursor to this particular obsession was passed on to me by a friend sometime in mid-July in the midst of a Batman movie marathon. I devoured half a plate of her cookies that night, realizing between bites that I was the closest I had been in a long while to my perfect cookie. Alas. Cocoa nibs, despite the glorious texture that they impart on baked goods, are just too damned expensive to use all the time… and back in July I was thinking that I wanted to make these cookies all. the. time. 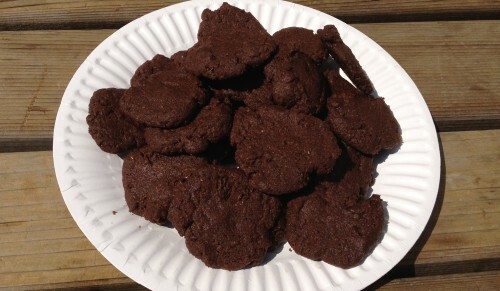 So I replaced the nibs with espresso, and every subsequent meeting, birthday and beach picnic became yet another opportunity for me to evolve my take on these cookies. I am sure that I have made them at least 5 times in the last 5 weeks. These are not even a particularly summer-friendly cookie. 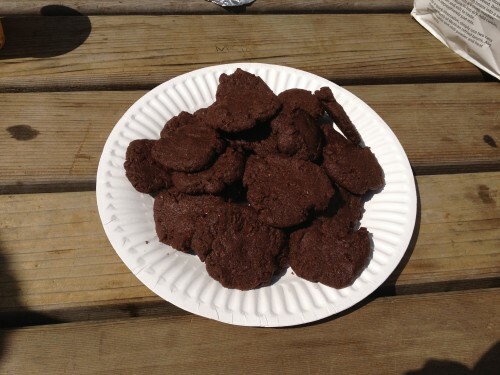 The things about them that I most adore – the crumbly texture, the pockets of chocolate – lead to a lot of broken, half-melted cookies when you’re sitting out in the sun during a long afternoon potluck in the park. But even though they weren’t always pretty, each batch disappeared almost as quickly as it came together. Just once did I hesitate to make these cookies, after it briefly occurred to me that perhaps tiny, caffeine-loaded chocolate bombs might not be the most appropriate snack for a little kid’s birthday party. I feigned ignorance and brought them anyways. Inspired by David Lebovitz and Clotilde Dusoulier. These cookies turn out best when I am able to overcome some of my most engrained baking tendencies. First, they want to be very small, which goes against every basic cookie forming instinct I have; despite my best efforts, my spoonfuls tend towards the size of an ice cream scoop rather than a small teaspoon. Second, the cookies stay soft while baking and only firm up once they begin to cool. Trust your timer and don’t be deceived. If they turn out dry, reduce the cooking time by a minute for your next batch. Preheat your oven to 350F and line a baking sheet with parchment. Melt half of the chocolate (70g) in a small heat proof bowl over simmering water. Remove from heat and let cool – I usually place it in the fridge for 10 minutes. In another small bowl, stir together the flour, cocoa and espresso powders, and baking soda. Cream the butter and brown sugar until just smooth, either by hand or using a mixer. Gently fold the melted chocolate into the butter mixture by hand, followed by the flour mixture. Stir by hand until just combined, and then stir in the remaining chocolate chunks. Scoop the dough onto the parchment using a small teaspoon, and flatten with your finger or the back of the spoon. 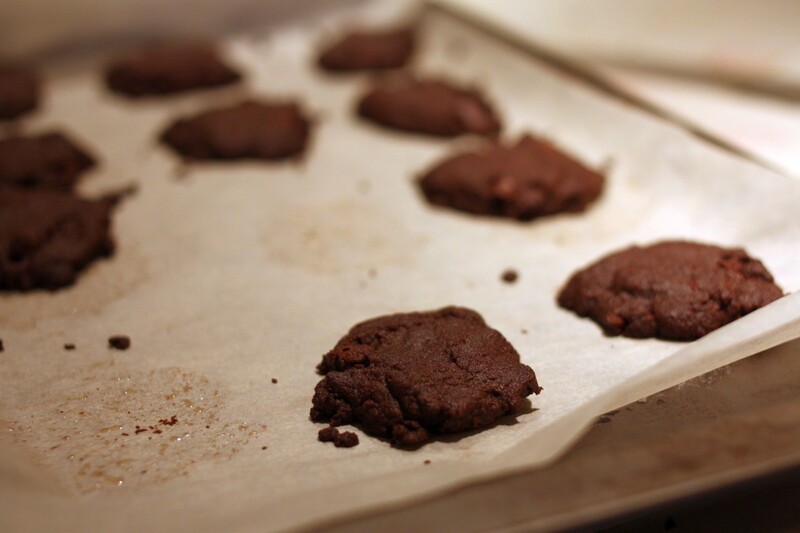 If the dough becomes too warm, place the cookie sheet with the cookies in the fridge for 5 or 10 minutes to firm up. Bake for 10-12 minutes. The cookies will remain soft – let them set on the pan for a few minutes before removing them from the cookie sheet to cool fully. You are currently browsing entries tagged with short bread at Perpetually Astonished.